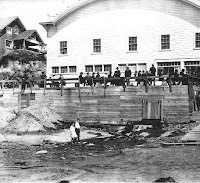 I recently learned from Cape Meares resident Deborah Thomas Neal that Bayocean's natatorium had competition in its day. I'll admit to having thought the term was just something the Potter's made up. Not so. The American Heritage Dictionary of the English Language, Fifth Edition defines "natatorium" as "an indoor swimming pool" and says the use of the term began somewhere between 1885 and 1890. Today, indoor swimming pools are common place. Perhaps at the end of the 19th Century promoters thought it would increase business by giving them a fancier name. 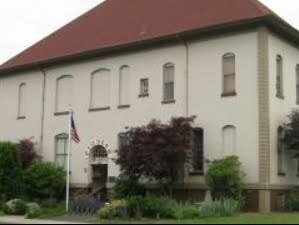 Several were constructed in the Pacific Northwest soon after the start of the 20th Century. 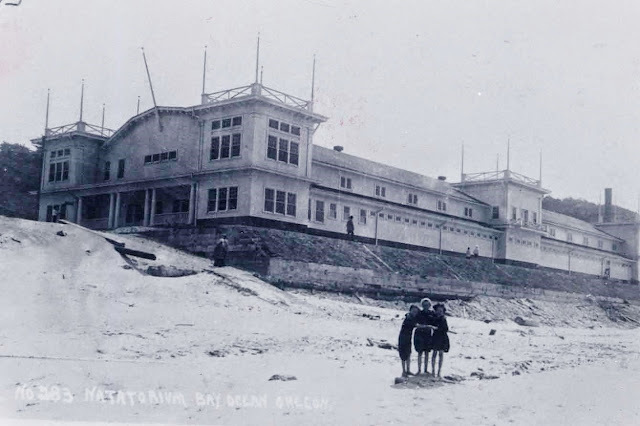 The Nye Beach Natatorium in Newport was much closer to Bayocean, and thus would have been tougher competition. 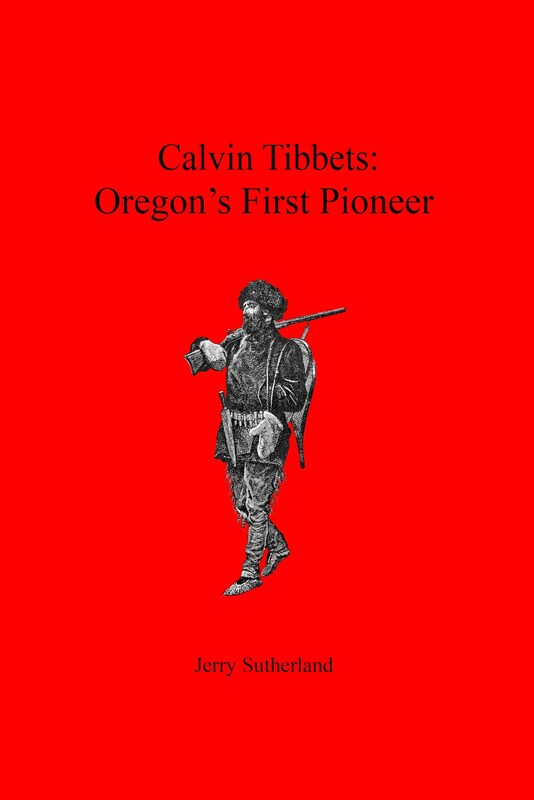 Descriptions of photos in the Salem Public Library collections say that it was opened in 1911. Since it was rebuilt after burning down in 1922 it must have been a profitable business. But by 1966 it was in disrepair, and eventually was replaced by the Nye Beach turnaround and beach access. 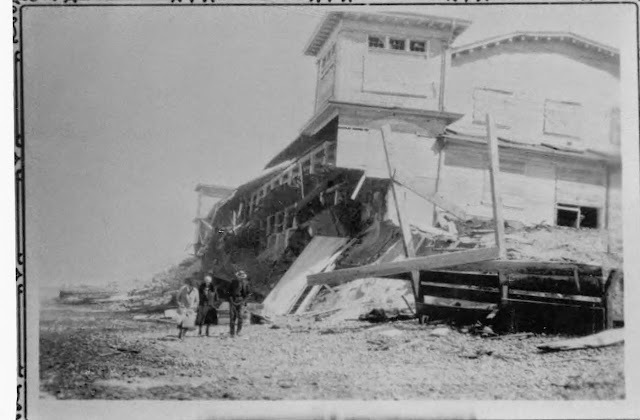 This was a use much better suited to the location, as made evident by a 1939 photo by Roger Hart showing ocean waves crashing onto the natatorium's porch. Rockaway and Seaside built natatoriums as well, in the 1920s. It was evidently quite the rage, according to More Beneath Sands of Oregon Coast Town Than Meets the Eye, a story told with the help of local historian Don Best. Unfortunately their fates were all the same - though the Rockaway Natatorium fought river more than ocean. Using ORMAP with a Tillamook County tax map overlay, the GPS coordinates of the southwest corner of the lot that the Bayocean Natatorium are 45.527644, -123.955606. You might reach it on very low tide in the winter. Concrete chunks were last seen years ago.